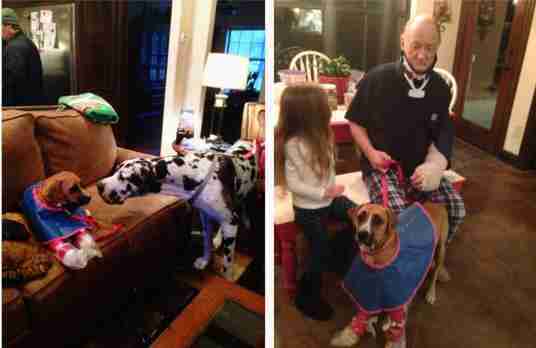 Miracles do exist - and these two dogs slowly recovering in the face of tragedy prove it. On December 26, three dogs - Judy Brown, Lucy and Elvis - were riding in a car with their owners, Yolanda and Charles Futrell, when another vehicle - allegedly street racing - hit their car at full speed, according to ABC 13 of Houston, Texas. Yolanda and Elvis, a male dachshund mix of unknown age, sadly lost their lives in the crash, leaving Judy Brown, Lucy and Charles Futrell as the sole survivors. Elvis appeared to have been run over, George Anderson, captain of the Houston Fire Department, told The Dodo. Lucy was found lying next to Elvis on the road when firefighters arrived. She was unable to move, but was awake and alert. Judy Brown was up and running around near the scene of the accident. "She had some serious road rash injuries," Anderson said. "She had lacerations down to her bones and tendons." Houston firefighters immediately brought both surviving dogs to North Houston Veterinary Specialists-Katy (NHVS-Katy) for medical treatment. Charles was taken to a hospital and treated in the ICU, according to ABC 13. Since the dogs' names were initially unknown, they were given nicknames by NHVS-Katy staff. Judy Brown, a 2-year-old boxer mix, was dubbed "Faith" and Lucy, an 8-year-old dachshund, was given the name "Hope." Suzanne Merritt, assistant manager at NHVS-Katy, told The Dodo that, in this case, the names "Hope" and "Faith" are actually quite special. Coincidentally, the Futrells had a family member named Hope, and Faith happened to be the late Yolanda's nickname. Eerily, the NHVS-Katy staff didn't discover this information until after the pups had been given their new names. "Judy Brown is doing very well," Merritt said. "She suffered severe wounds on both front legs and minor lacerations on the body. She has recovered well, was released from the hospital, and is undergoing frequent bandage changes in the treatment of her leg wounds." 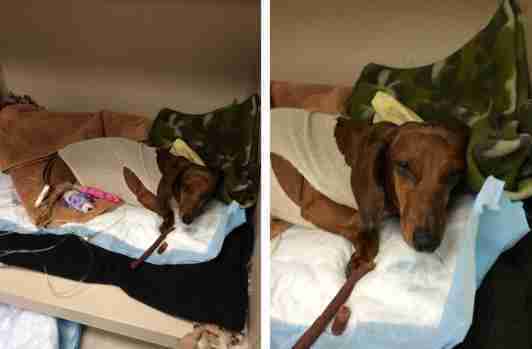 Judy Brown is currently being cared for by extended family members while her owner recuperates. Merritt said that, according to Judy Brown's family, she's been over to visit Charles several times. Lucy, however, is still hospitalized. "She had several lacerations on her side which have been repaired," Merritt said. "We have been monitoring her for a disc compression injury in her neck as she is unable to use her hind limbs," Merritt said. 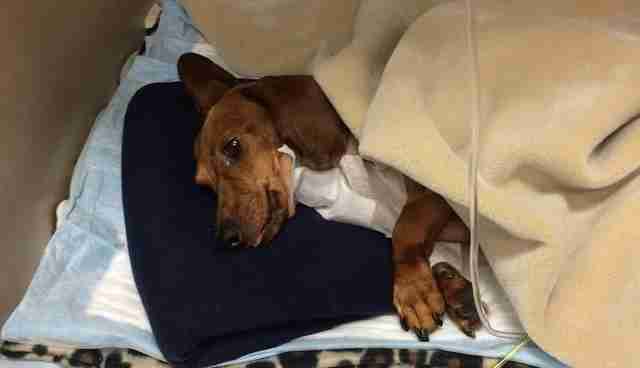 "Yesterday, she underwent surgery to relieve the compression. We are still monitoring her and will begin rehabilitation soon." Lucy and Judy Brown truly are two miracles to have emerged from such a tragic incident no pet or family should ever have to endure. 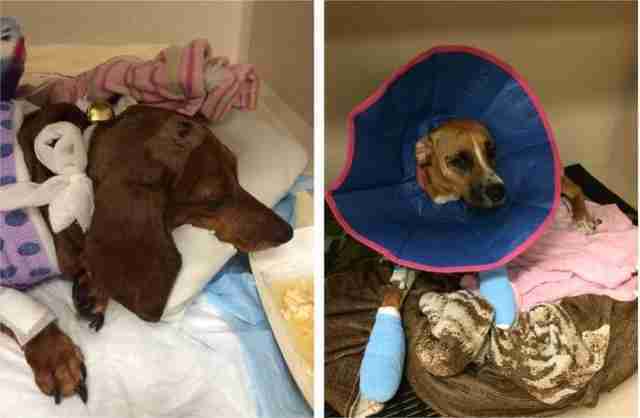 To support these miracle dogs and to get updates on their progress, you can check out their recovery fund, started by George Anderson, and donate.